This was modern folk theatre at its best. Sean Cooney, the main songwriter, has a wonderful knack of writing songs around themes and people that have been forgotten. Sean, Michael Hughes and David Eagle are all from Stockton. The working-class history of the north eastern town permeates and finds a nest in the wonderful song writing that The Young'uns are so well-known for. 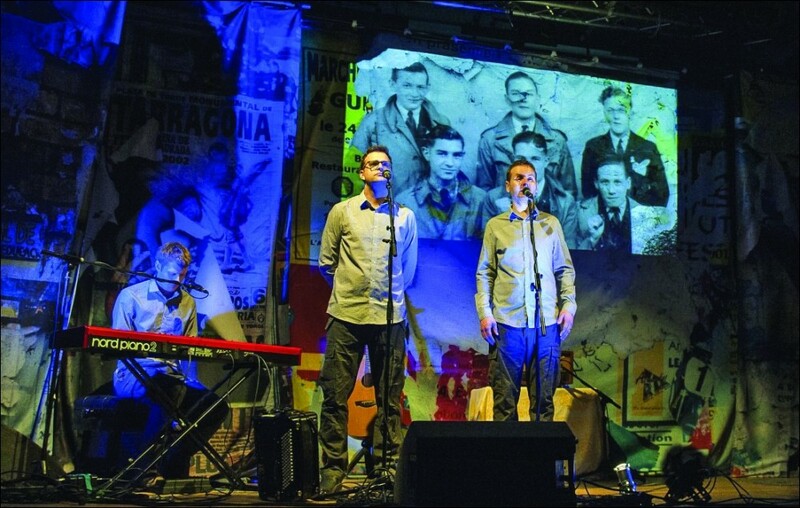 The Ballad of Johnny Longstaff is the story of one man's adventure from begging on the streets in the north of England to fighting against fascism in the Spanish Civil War, taking in the Hunger Marches and the Battle of Cable Street, in the 1930s. In Hull, the working class fought British fascist leader Oswald Mosley in the Battle of Corporation Fields. Stockton had its own battle to kick Mosley out. Johnny Longstaff witnessed some momentous events and we hear his journey through these songs. Also, through the archives of the Imperial War Museum, we hear him talking and taking us along with him. It's some ride! We witnessed 16 especially composed songs, spoken word, striking imagery and Johnny's voice to tell a remarkable story oozing with relevance to today. We follow Johnny's footsteps through his political class awakenings in London sleeping on the streets, being reprimanded for knocking a small bottle of perfume over while working in a hotel, and having six weeks wages docked for it! Onto the Kinder Pass mass trespass march and his experiences of fighting fascists at Cable Street. It was here he realised whose side the police were on. The show is poignant, informative, emotional, and in places humorous. Some of the songs have new words to the melodies of the socialist 'Internationale' and 'Ay Carmela' - both sung with passion during the Spanish Civil War by members of the British Battalion. Johnny fought at the Battle of the Ebro, Brunete and the horrendous battle to take The Pimple (Hill 481), where many of his friends were killed. He saw connections between the poverty in Spain and that of his homeland. He was a working-class comrade in the forefront of our collective working-class history. It's a must see show; you will not be disappointed.